As a course director, it is likely that you are already engaging your students in some type of experiential education (EE), whether that is through using simulations in the classroom, inviting in a guest lecturer, or engaging students in a community initiative. The pan-university EE Common Language document (2017) provides a common language for describing the variety of EE strategies taking place at York University, and it details three main areas of focus. Classroom-focused EE exposes students to concrete learning activities that require them to reflect on what they have experienced in relation to concepts/theories being covered in the course. All classroom-focused EE strategies contribute to addressing student learning outcomes. Examples of experiential activities include: films, guest speakers, case studies, simulation and role playing, course-based research, with-in community learning activities. 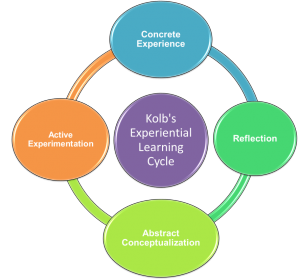 How and why should I engage students in experiential education? Experiential education can help students develop and strengthen skills and attributes related to academic performance, civic engagement, and employability. This presentation and literature review prepared for the Department of Psychology outlines some of the findings related to the impact of Experiential Education. Simply giving students a concrete experience is not enough to foster critical thinking. An experience alone may not deliver the appropriate lesson unless it is framed and debriefed appropriately. While the cycle is a simplified description of how students learn, it also serves as a course planning tool. In a typical course, a student can go through the cycle once or multiple times, depending on their level of engagement and the intentions of the instructor. It is through the intentional sequencing of activities in line with Kolb’s Cycle that instructors can achieve the dual outcome of teaching course material and fostering critical thinking. Instructors teaching in this manner will also find that, through instructing their students, they too come to realizations and new understandings about their work and subject matter. Structured reflection is integral to all EE strategies, and it can be defined as any planned activity or exercise that requires students to refer back and critically examine the concrete experience in light of existing theory and/or what is being covered in the course. For example, following a concrete experience, students may have to: explain why certain events occurred; justify the necessity of certain procedures; consider the experience from multiple perspectives; or challenge their assumptions or beliefs. The specific reflection activity or exercise will depend upon the intended learning outcome(s) for the students. You can learn more about reflection, its benefits, and see examples of reflection activities and assignments. Community partnerships are an essential component of many EE strategies, and like any relationship, they are built on time, trust, and experience. Therefore, where possible, the goal should be to foster an ongoing, reciprocal partnership. A long-term collaboration will yield tremendous results, as each year, you and your partner are able to improve on the student experience. Share stories for YFile, Teaching Commons Newsletter, etc. 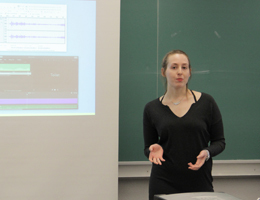 The Faculty of Health is also making available a limited number of free, one-day parking passes to support guest speakers or community partners who may visit your class as part of an Experiential Education activity. Learn more about parking passes. Teaching Commons: Support and resources around course design, learning outcomes, assessment, teaching strategies, and more. The Teaching Commons also offers EE workshops and the EE Bootcamp, where you can learn how to implement EE in your course. YU Experience Hub: Pan-university resource containing information for community partners, students and faculty members, and EE examples and testimonials. York-TD Community Engagement Centre: Located in York Gate Mall, this satellite office facilitates community partnerships between York University and the Black Creek community. Career Centre: Resources and support related to career exploration, professional etiquette, job search and more. The Career Centre may also be able to offer targeted support, like helping your students incorporate their EE experience into their resume. Learning Commons: Support and resources for students, related to reading, writing and learning skills. The Learning Commons also offers resources and workshops for faculty members and TAs (e.g. teaching academic literacies). The Student Guide to Experiential Education- A resource to help students learn more about EE, and succeed in EE courses. Simulated Persons Methodology: The website is part of a project led by Eva Peisachovich, Assistant Professor in the School of Nursing. Visit the website to learn more about how to use simulations in the classroom, see examples, access teaching tools, and sign up for upcoming training workshops. For additional tools and resources please contact the EE Coordinator. This is a non-exhaustive list of some past and current EE courses. If a course you have taught is not listed, please contact the EE Coordinator so that it can be added to the list. The EE Coordinator can also help you to use the common language for EE to identify and describe the activities you have included in your course. Faculty members may request a free, one-day parking pass for guest speakers or community partners who visit your class as part of an Experiential Education activity.